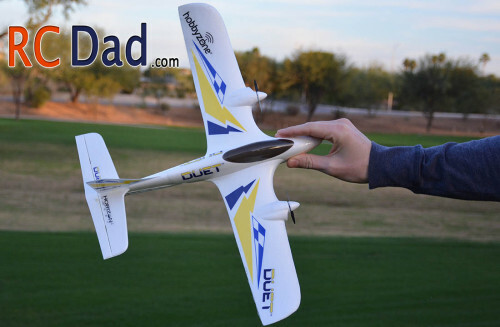 I was very hesitant when buying the Duet, mostly because my experience with flying RC planes has ended in expensive crashes. I never even got the real life training because I would always crash within seconds of taking off. The other reason was the mixed reviews on this plane. I’ll go over why some people left negative reviews and some tips on flying the duet for those who are thinking about getting one. For $60 bucks you get everything you need to fly. Even the 4 AA batteries for the controller were included. That’s not a bad price at all for something that flies this good. Now, by saying this thing flies good, I’m speaking as a beginner pilot! People who are flying larger 4 channel jets for example will think this thing flies slow and has very little control. As a beginner pilot who just wants something to cruise around the park, the duet is perfect. If you don’t want to invest a lot of money to find out if you’re into the hobby or not then I would recommend the Duet. First off it’s almost impossible to over bank and stall this airplane because there are no ailerons, all your turning will be done by differential thrust. That means you only have to worry about 3 channels instead of 4. Even without ailerons, the duet still turns pretty good! The duet doesn’t like to stall. By simply giving it some extra thrust, the duet seems to forget that it was about to nose over and stall all together. The 3 channels will allow you to have full control of climb, steering and throttle. Flight times are between 4-8 minutes depending on how fast you’re flying and that’s pretty good considering the battery is a tiny 150maH lithium. One thing that annoyed me was charging from the controller so I bought this USB charger for around $10 bucks so I wouldn’t have to drain the controller batteries. I also picked up some spare batteries which I’ll include a links to down below. The battery attaches with Velcro underneath the nose and I’ve never had a problem with it falling out. I was really surprised with how quite the motors are! At a good cruise speed, around 40% power you can barely hear the motors. This thing is silent when flying! Around 60 – 100% they do start to vibrate some but nothing too bad. I also reviewed a 2 channel flying car as you can see here. If you wanted something even easier to fly than the duet and that can take even harder crashes then check out my review on the Hot wheels flying car. The main difference between them is the Duet has an extra channel which controls the elevator, giving you the ability to easily do loops, get out of stalls, and better overall control. The biggest complaint I’ve seen about this plane was its build quality and I have two things to say about that. First, it’s $60 BUCKS for a READY TO FLY! It’s the best deal you’re going to get. The build quality in my opinion was better than what I expected for $60bucks. Second, it was built to fly slow and just have fun with. I’ve hit myself and my camera girl Carmen with this plane and it doesn’t hurt at all! The propellers are even light enough to where they are not going to cut you like a lot of bigger planes. 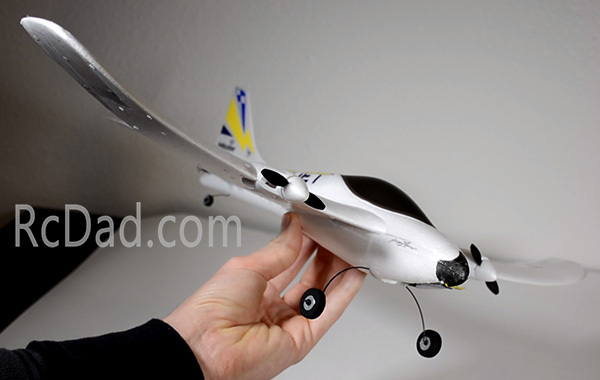 It will take off and land with the wheels on but don’t expect it to steer while on the ground. The wheels are a dense foam and spin, but not very well. Being so light weight, crashing puts less stress on the structure, resulting in less damage. Now, I do fly over grass, and I highly recommend finding some thick grass while learning to fly and staying away from trees. If you’re Crashing on dirt or asphalt, the duet isn’t going to last very long. I’ve had some light crashes in the grass and one hard one where I cracked the wing in half. I just tapped over the crack and it was ready to fly again. It would be hard to crash this thing to the point where you couldn’t just tape it up and fly it again. One thing I noticed on mine is that the vertical tail needed a little tape to keep it from flying off. I wouldn’t recommend glue because most glue will dissolve Styrofoam. The front landing gear is easy to remove and since I only fly mine over grass I took it off. I also painted the nose black because landing in the grass over and over started to turn it green. Loops on this plane will take a little practice. Because the propellers are so small, they are not going to be able to easily pull this plane through a loop. You’ll need to get your speed up fist. Get up pretty high, then nose down with some power. When you see the plane pick up speed then quickly pull the elevator up and you’ll do a loop. If you maintain speed through the loops, it’ll continue doing them as long as your maintain enough speed. Taking off is easy, just make sure to have at least 75% power when climbing and when the nose starts to get too high apply a little down elevator and your Duet will climb nice and level. Keep the elevator controls gentle! It gets more responsive the faster you go so don’t go yanking it down when you’re close to the ground. The controller has trim tabs to adjust the elevator and turning. I had to put a lot of down elevator trim when I first flew mine to keep it from constantly nosing up and stalling. The left wing has two dark stripes on the bottom that will help with orientation. It helps if you fly in the middle of a field and have the plane fly around you until you get the used to the controls because remember, when it’s flying towards you, turning will be reversed. The Duet will cruise nice and level at around 30 – 40% throttle flying at a comfortable 8-10mph. It does get tossed around a bit in the breeze so fly in the early morning or in the evening when there is little to no wind. I’m really glad I ignored all the complaints and put aside my fears of crashing and went with the Duet. It is a fun, low maintenance and easy plane to fly. That’s my review on the Duet by Hobby Zone. Thanks for reading. I appreciate comments and questions! If your having trouble considering your next airplane, I would definitely reccommend the UMX Habu 180. It has SAFE, AS3X, and a panic recovery switch. It comes in BNF only and it a great flying plane! I plan on it! Sweet looking little jet.